Comedian Kevin Hart’s son Kenzo celebrated his first birthday this past weekend but the party theme is getting some pretty tough backlash on social media. 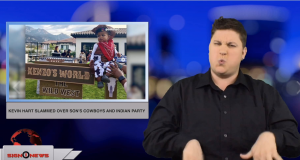 Hart and his wife in Eniko Parrish threw the baby a cowboys and indians themed birthday party. Parrish posted these pictures on Instagram showing the guests wearing Native American blankets and cowboy hats. Social media users are saying the theme is a form of cultural appropriation — that’s when elements of a minority culture are adopted by dominant culture and is considered a symbol of oppression. Some even say the timing of the party is insensitive, citing the celebration is so close to Thanksgiving. Hart and Parrish have not yet commented.